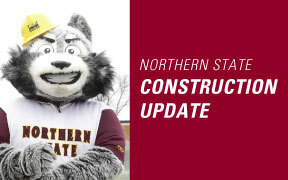 NSU Facilities Manager Monte Mehlhoff has released a campus construction update. Closures near and around the Science Center are expected to last all week. Plumbers and electricians continue with wall rough-ins on the south wing's second floor. Plumbers also are preparing to supply gas to heaters and water to the building. Crews have framed most of the walls on the south wing's first floor and have started on the north wing's second floor. Sheetrock is being installed on the upper portions of the walls ahead of ductwork. The HVAC contractor continues to assemble ductwork for the south wing's second floor. Exterior window blocking and installation of temporary enclosures continues. Gas line installation is complete; the meter was expected to be added this week as well. Roof project deck work is complete and installation of perimeter metal is under way. Ten new air handlers that will service the Barnett Center arena are set to be installed beginning the week of Nov. 5. Electrical work for the backup generator is being done. Both new boilers are up and running. Work on the new roof is scheduled to begin the week of Nov. 5, but will depend on the weather. A new chiller unit is set to be installed Nov. 5.